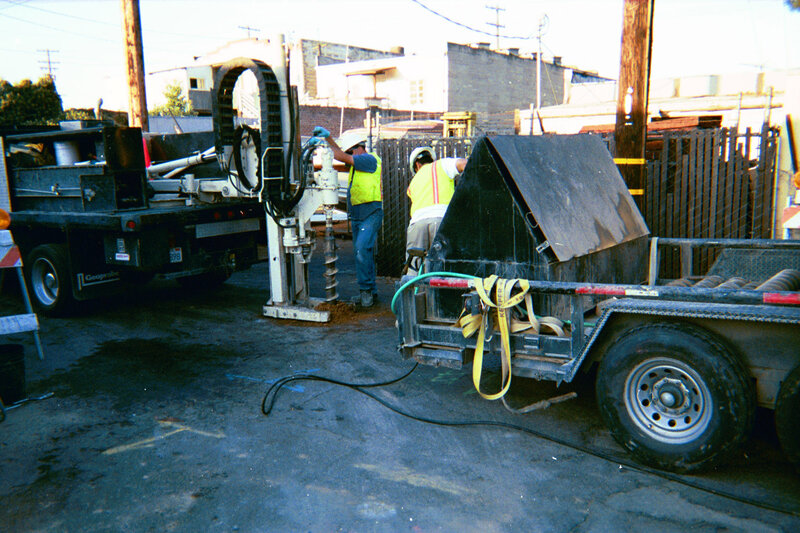 Installation of a groundwater monitoring well using a low clearance drill rig. In November 2000, a lawsuit was filed by the City of Lodi in federal court with the Eastern District of California seeking the cleanup of contaminated soil and groundwater found at the former Busy Bee dry cleaners site resulting from the alleged dumping of dry cleaning solvents by former local area businesses. That lawsuit was resolved by settlement in 2005, with the Defendants placing $475,000 into a trust for use in the cleanup of the site, and a Pay for Performance contract was awarded to E2C Remediation to perform the site cleanup. Because of the size of the contamination plume (spreading out over almost 3 city blocks), it was necessary to install two separate remediation system compounds, and dozens of air sparge wells, extraction wells, and groundwater monitoring wells.